Application discovery and dependency mapping (ADDM) solutions automate the process of discovering and mapping transactions and applications to the underlying infrastructure. The service models created by ADDM solutions then become invaluable tools for supporting many aspects of datacenter management. 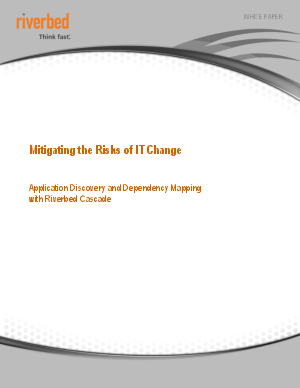 Riverbed® Cascade® is an application-aware network performance management solution with built-in ADDM capabilities. Cascade quickly provides a complete and accurate inventory of the IT environment, including an understanding of how services and their underlying IT infrastructure impact the business. The result is dramatically shortened project times, reduced costs, and improved efficiencies. Download the whitepaper to learn more.